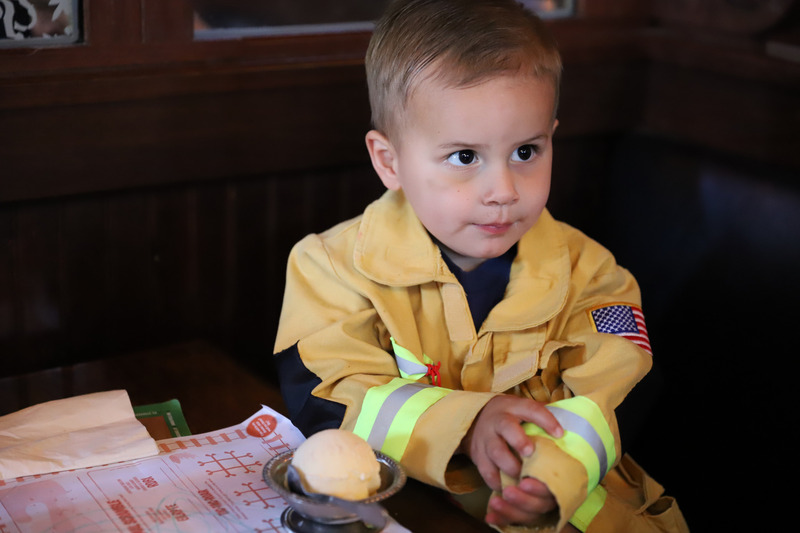 This young spaghetti fan enjoyed being served by firefighters during Tip-A-Firefighter during the dinner shift on Wednesday, May 30. REDLANDS, CA., June 1, 2018 – In true first responder fashion, local firefighters came out to lend a helping hand at the annual Tip-A-Firefighter at The Old Spaghetti Factory on Wednesday, May 30. Firefighters from Loma Linda, Redlands and Colton Fire Departments came out to serve lunch and dinner to guests at the Redlands restaurant. All tips collected by the men and women in uniform were donated to Loma Linda University Children’s Hospital (LLUCH). The event raised more than $5,000, which will go toward Vision 2020 – The Campaign for a Whole Tomorrow, and the construction of the new Children’s Hospital tower. The Old Spaghetti Factory in Redlands has successfully hosted the annual event for the last seven years, raising nearly $40,000 for LLUCH. Scott Perryman, MBA, senior vice president/administrator, for the hospital had the pleasure of dining at the restaurant with his family and was served by local first responders.